Some of us need lots of reminding. Fortunately, your Palm device is always around to gently pester you into doing what needs to be done — when it needs to be done. It’s sort of a like an electronic mother-in-law. Even if your Palm device is turned off, the alarm wakes it up and makes a series of tiny beeps. You turn off the alarm by tapping OK on the screen. 1. With the Date Book visible, tap the name of the appointment for which you want to set an alarm. The insertion point appears on the line with your appointment’s name. 3. Tap the Alarm check box. A check mark appears in the check box, and the alarm setting appears to the right of the check box, as shown in Figure 1. Normally, the alarm setting is five minutes. That means the alarm will go off five minutes before the scheduled appointment time. 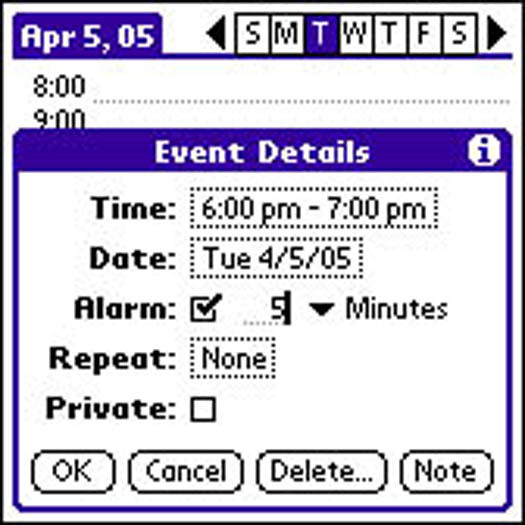 Figure 1: Select the Alarm option so that your Date Book can remind you of an important appointment. 4. To change the alarm time, tap the word Minutes. A list appears with the choices: Minutes, Hours, and Days. 5. Tap your choice of Minutes, Hours, or Days. The list disappears, and the choice you tapped appears. 6. Enter the number of minutes, hours, or days before the appointment that you want the alarm to sound, using either the on-screen keyboard or Graffiti. The number you enter appears next to the Alarm check box. The Event Details dialog box closes. You should select the Alarm check box while (rather than after) creating an appointment.